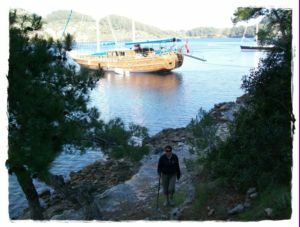 We trek in the most beautiful coastal area of the Turkish Mediterranean laying between Antalya and Kas. Known to the ancients as Lycia this fabled coast of clear turquoise blue water is rich with archaeological sites. Fragrant pine forests tumble down a back cloth of mountain slopes to end abruptly in red cliffs, secret coves and sandy beaches. We visit splendid Greco-Roman ruins of the lycian period: Caunos, Letoon, Pınara, Xanthos... With its excellent climate, guaranteed sunshine, this delightful coastal offers to spend holidays trekking in a culture, history and nature combining area. Meet the group at the airport and transfer to the pension for overnight. BB. In the morning transfer to Ulupinar (1 h. ).We start our trekking in this small town . We walk through a forest path with splendid scenery ,beautiful landscape .Our trek continues by a path by the sea that bring us directly to the Cırali village, known by the local inhabitants as the " burning mountain " (Yanartas), it is a result of escaping natural gas. 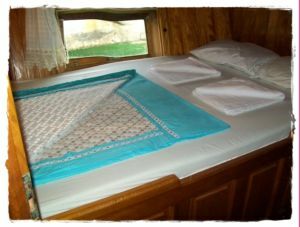 Overnight pension (5 h walks). . BLD. In the morning cross on foot the traces to Olympos, fine sites extension by the sea with a beautiful beach that a charm irresistible. Punctuated with unexplored antique ruins, the path climbs till Yayla (680 m) by the dominated pines in the heights Mt Musadag. Arrive to yayla ,we may to see shepherds with their flocks according to the season. We continue our walking while taking a path that descends through the forest by a throat to situated Andrasan by the sea. 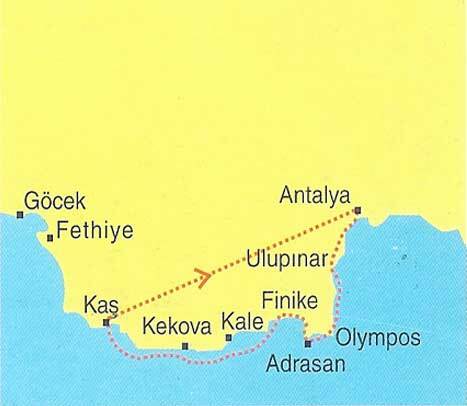 Our bus transfer us to Finike where our boat wait us. Overnight on board. Today, we sail to Demre , we will stop to visit the archaeological ancient ruins of Myra , and the Church of St. Nicholas was built in the third century. After visit we sail again through Andrasan while offering nevertheless splendid views on the creeks and the island of the direction . continue the sailing to Gokkaya where we will spend the night. Overnight on board. In the morning we sail through Kekova island and the channel to the village itself. As trade between the Lycians and the other Hellenistic Greeks increased so did piracy and many harbours and ports were fortified in the same way that Kekova is. We visit Sumela castle, the medieval castle sitting high on the hill is surrounded by the remains of the ancient city and the climb to the summit, through the little village where is worth it just to sit in the little theatre. Overnight on board. After the breakfast, we leave our boat for a short walking. The path starts with follow the quotation to the Aperlae. Here before we board our boat , we may have possibility of swimming. We embark again our boat for the visit of along to beach to Kas which lies at the neck of a small peninsula in the Mediterranean. Overnight on board in the bay. (3-4 h.walk). 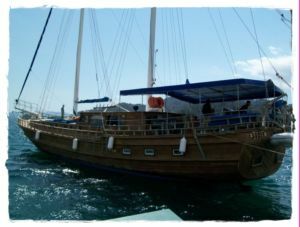 In the morning we leave our boat reluctantly and transfer to Antalya. On the way stop to visit Phaselis was founded in the seventh century by colonists from Rhodes. 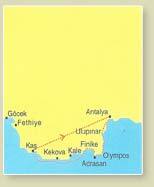 It was a Lycian city and had three important ports which were constant use. Driving to Antalya is an attractive city with shady palm-lined boulevards. Kaleici where we will stay is narrow, winding streets and old wooden houses abut the ancient city walls. Overnight pension.